NASCAR’s Denny Hamlin tore his right knee’s anterior cruciate ligament (more commonly known as an ACL, or HOLY CRAP THAT HURTS) Tuesday night playing basketball. Today? He’s back in the car for Sprint Cup practice like nothing even happened. Dude is a beast. According to Motorsport.com, an MRI confirmed the torn ACL on Wednesday morning and while he was medically cleared to race for the rest of the season, he will require surgery to properly repair the injury after the season is over. 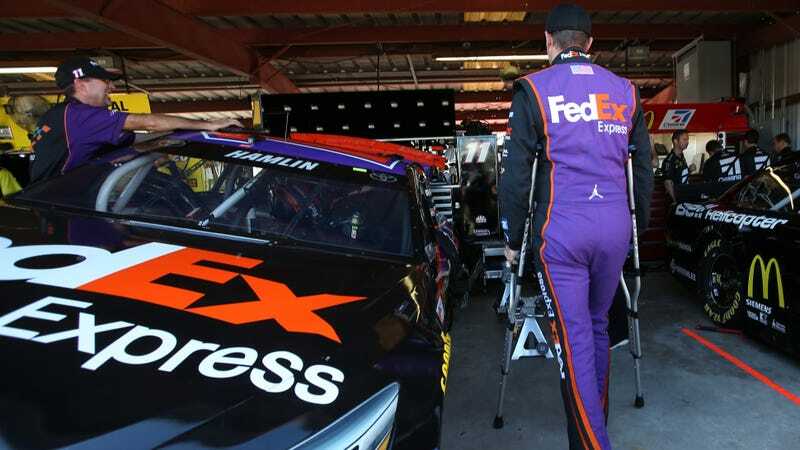 Hamlin is in the playoff-style Chase for the Sprint Cup for sure, with one win this season. He’s currently eighth in the points standings. So, why not crutch on over to race the car this weekend at Richmond International Speedway? Per NASCAR, this isn’t the first time Hamlin has raced with a torn ACL. In 2010, another basketball mishap tore the ACL in his left knee a month before the season started. He put off surgery until after the sixth race of the year, where he won at Martinsville Speedway. That’s crazy, but seems to work. As NASCAR writer Holly Cain explains in this rant-I’d-like-to-hug, you can’t reasonably expect drivers not to do what they enjoy off the track. So, the next best thing is to pay close attention to what the doctors recommend when something does go wrong and make sure it receives proper treatment when there’s a good window to let it heal.